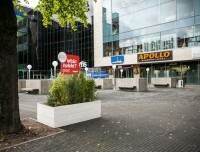 We carried out a campaign to Simpel (phone card) in front of Solaris centrum / Nokia Concert hall. Message was “Mida hekki” (a slang that in direct translation means “what the hedge” but metaphorically something like “what the hell”). So if you change your Smart or ZEN phone cards to Simpel then you can speak without loading any money to it. Campaign lasts until 19 october 2012.